Blog reading has become a hobby to this new SAHM. Thanks to OMSH’s blog I found Kerflop’s spot in the blogosphere. Today Jessica asked her readers to write an essay to try to win parts of a JOYS filing system. The topic of the essay is What brings you Joy? How fitting this question is on the day that I became a mommy 4 years ago. All you have to do is look at my blog entries about my family to know my choice. Clearly I prefer to spend quality time with them and could use the JOYS system to assist me in more of this important time. Prior to being married and having children I would have said that material items, travel and hockey games brought joy to my life. Since then I know that all of that means nothing without your family. Whether it is my nuclear family or the wonderful extended family that I am blessed with, being with them and spending quality time together is what brings me joy. 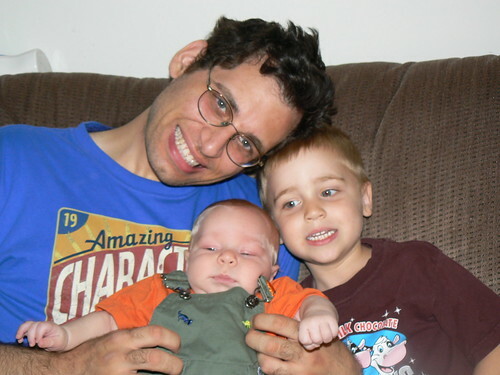 My husband of 6 years and our two sons bring me the most joy. Spending time with “my boys” is something I love to do. Just the simple times together like curling up in bed on a Sunday morning to watch Mickey Mouse Clubhouse or read a book together is a special moment. The simple smile from my three month old’s face melts my heart and makes me know that all of the sacrifices to be at home with him to watch him grow is worth it. There is also nothing like a big hug and wet kiss from a 4 year old before he heads out of the house to school to let you know you are loved. Being able to reminisce about the milestones of your children, flipping through old photos of my childhood, talking with old friends, and imagining growing old with my husband (the love of my life) and seeing our boys as fathers brings me extreme joy. *sigh* The sad thing is I will blink and before I know it my little boys will be grown men. So the real gift of joy in my life is taking time to enjoy the little moments while they are here. As I see today, with my now 4 year old, they grow up too quickly and you can not get those precious, joyful moments back. « 4 years ago tonight .. .